As a business owner or business professional, do you know how the Affordable Care Act (ACA) affects your business? Many components of the ACA took effect in 2010. However, one of the most important provisions of the law - the employer mandate - wasn't enacted until January 2015. Many times business owners ask us: What is the self-employment tax? and How does it effect me as a business owner? Most business owners realize they have to pay a variety of taxes. However, many entrepreneurs aren't aware that they must also pay a federal self-employment tax. The Financial Accounting Standards Board (FASB) has introduced a series of new revenue reporting rules which will go into effect in 2017. Every publicly traded company will be affected by the new rules by December 15, 2016. However, all private businesses will also need to be prepared for the new changes because they must follow the new requirements as of December 15, 2017. 1) Like Me On Facebook Sweepstakes! Like Me On Facebook Sweepstakes! 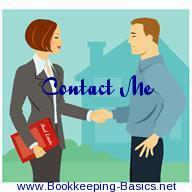 Hop on over to my Bookkeeping Basics and Horne Financial Services Facebook page. Hit the "LIKE" button and you will be entered to win a $25 Visa gift card! Be sure to share with your friends for more chances to win as you will get an additional entry for every person that you share with. CLICK HERE to enter the Like Me On Facebook Sweepstakes now! These convenient excel bookkeeping templates are great when you don't want to spend a lot of money on accounting software when getting started. 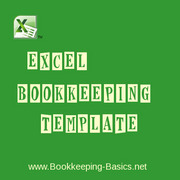 Rather than having to purchase bookkeeping software such as Quickbooks, you can get started right away with the excel software you already have utilizing these free and inexpensive excel bookkeeping templates and excel spreadsheets for sole proprietor Schedule C's. 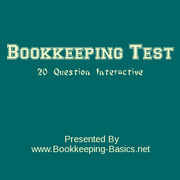 This bookkeeping test is a 20 question interactive exam to help test your bookkeeping mettle. Your financials are a very important aspect of your business. Whether you are a business owner or bookkeeper, it is a good idea to evaluate your candidates or self with a bookkeeping test such as this one in order to ensure you are getting or providing qualified, accurate bookkeeping expertise. Missing skills can lead to costly mistakes, and there is no need to take chances. Recording the daily financial transactions of a business requires more than just knowledge of bookkeeping software such as Quickbooks. This bookkeeping exam can help to assess a candidates’ knowledge of accounting fundamentals, from general ledger, inventory, payroll, accounts payable & accounts receivable, to invoices and financial reports. CLICK HERE to take the Bookkeeping Test now! These bookkeeping tutorials and bookkeeping courses are basic free accounting tutorials that will teach and visually show you by video how to do all the different aspects of bookkeeping. 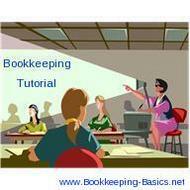 Each of the basic tutorials are presented as a written article outlining how to perform a bookkeeping or accounting function. In addition to each of the accounting tutorial articles, I have included a video series of me personally teaching and visually showing you how to do the different aspects of bookkeeping in the Quickbooks accounting software. When you are watching a video make sure to subscribe to my YouTube channel as new videos are added every week!